Going interstellar is hard. The closest stars to the sun are generally several light-years away, so a trip would take decades at best. Not to mention that the road there is perilous: Particle impacts and radiation can easily destroy a mission on its way there. Angelo Vermeulen, however, likes hard problems. He has imagined a spacecraft dug into an asteroid, which evolves like an organism and could take us beyond the solar system. The best part? Vermeulen’s project isn’t science fiction but actual scientific research he’s pursuing at the Technical University of Delft in the Netherlands, where he is preparing a computer simulation for the proposed starship. And he isn’t alone. As more countries shoot for the moon and do-it-yourself groups help democratize outer space, the world’s top space agencies and major research universities are going one step further, increasingly turning to adaptive, biomimetic and evolutionary-inspired designs for space exploration. Bio-inspired design, scientists believe, can allow us to design more efficiently and react better to unforeseen problems. That adaptability, experts say, will be key in pushing farther out from Earth. The European Space Agency (ESA) is studying how organisms like fungi survive in the face of extreme radiation, such as after the Chernobyl nuclear disaster, to better prepare human space flights against ionizing radiation beyond the Earth’s protective magnetic field. At Newcastle University, Rachel Armstrong, a professor and specialist in space architecture who focuses on sustainability and bio-inspired design, is working on Project Persephone, a speculative “earthship” with an entire, organically developed city within it, which will orbit Earth. BIO-INSPIRED DESIGN IS ABSOLUTELY THE FUTURE. Raul Polit-Casillas, a Spanish architect and engineer working at NASA’s elite Jet Propulsion Laboratory, is trying to make select parts of spacecrafts multifunctional, similar to how human body parts function. For instance, he explains, the skin allows us to sense but also helps with thermal management, and so assists in protecting internal body parts from the outside. And at TU Delft, Vermeulen and his colleagues are designing a spacecraft that will feed off an asteroid’s resources and evolve in ways that mimic organisms on Earth. For sure, biologically inspired design has its limitations and will probably not be able to completely replace traditional engineering. “Biomimetics is good, but it’s not always the best solution,” says Dario Izzo, scientific coordinator of the ESA Advanced Concepts Team that looks at future technologies. In his view, future spacecraft would have a combination of bio-inspired parts and traditionally engineered parts. “We still do some things much better than what nature was able to develop,” he adds. 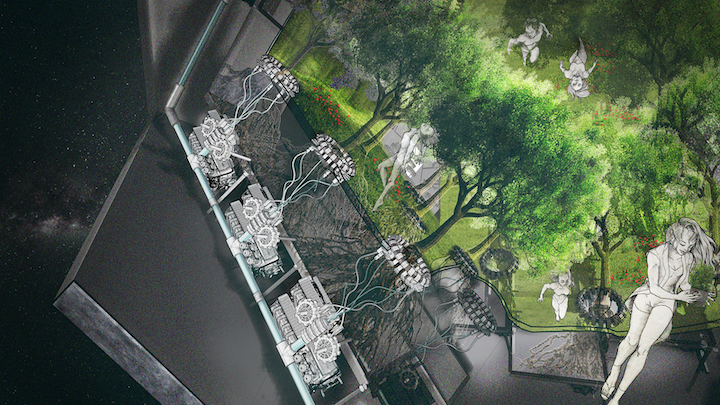 Already, bio-inspired space architecture is finding its way into reality. Casillas’ work, for instance, is being used in active NASA projects, “but I’m not allowed to say which,” he says. “That is why we need biological thinking about human space inhabitation,” she says.